Update on March 27th 2006: Thanks to fisheeyes's tutorial, the extra 3rd slot on the tables is now fully functional, and sims can place objects on it normally. Please, redownload the files and make sure they replace the old versions (they have the same filenames). These are 3-tile versions of some of the Maxis made 2-tile coffee tables from the base game for those of you who are like me and would like to have coffee tables of matching length for the 3-tile sofas. - The vertex/polygon numbers are the same as in the 2-tile Maxis versions. 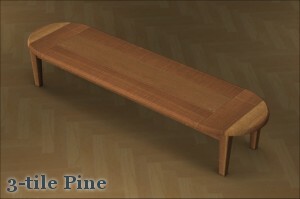 - The tables borrow their textures from the Maxis originals, including any recolors you may have for them. - To recolor these tables, recolor the 2-tile Maxis tables. 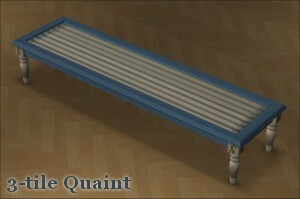 These tables themselves aren't recolorable (since they borrow the textures from the Maxis tables). 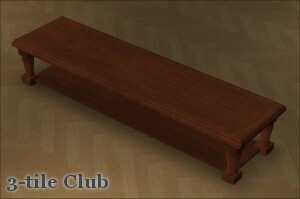 - The tables can be freely included in lot downloads. 429 people have said thanks to IgnorantBliss for this download.